Once students complete a MasteryPaths source item, you can view the breakdown of the mastery path ranges in the item. 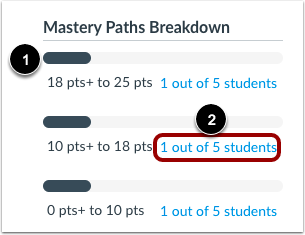 Each range includes a link that shows the number of students who scored in each range. 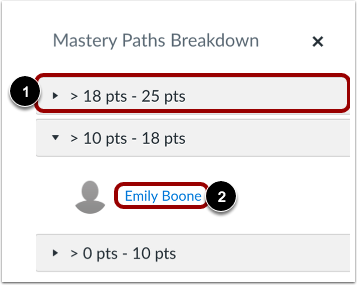 You can view a specific student’s score for the MasteryPath source item, view the student's submission, view the student's conditional content assignments, and send a message to the student. Note: MasteryPaths is currently a course opt-in feature. To enable this feature, learn how to manage feature options in the course features lesson. Click the name of the MasteryPaths assignment. In the sidebar, view the MasteryPaths Breakdown section. The section displays each of the three ranges and the number of students who scored in each range. The colored bar shows the percentage of students in that range . To view details for a range, click the link with the student results . The breakdown window displays the names of students in your selected range. If you want to view student names in another range, click the range heading . The current range will collapse and the selected range will expand. To view results for a specific student in a range, click the name of the student . When viewing a specific student, you can see the details about that student. Below the student's name, you can click the Send Message link , which opens a new browser tab in Conversations. 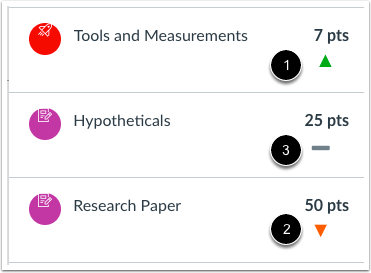 You can view the student's MasteryPath source item score  and the date of the submission . If you want to view the student's submission, click the View Submission link , which opens the student's submission details page in a new browser tab. You can also view the conditional items in the MasteryPath that have been assigned to the student . 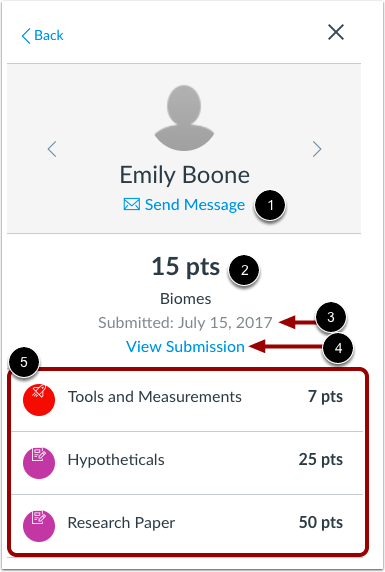 Each item includes the points possible for the assignment. 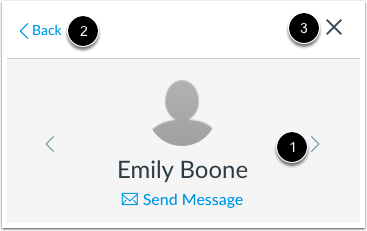 If the conditional items include graded assignments, Canvas displays an icon indicating the student's score compared to the original assignment score. A green arrow  indicates a student scored higher, a red arrow  indicates a student scored lower, and a gray bar  indicates the score was equal. To view another student in the same scoring range, click the Next or Previous arrow . To return to the list of student names and ranges, click the Back link . To close the breakdown window, click the Close icon . Previous Topic:How do I assign a conditional assignment for students to complete in MasteryPaths? 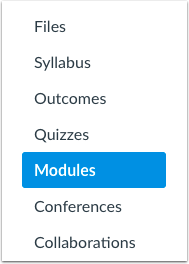 Next Topic:How do I use modules to view the progress of students in a course? Table of Contents > Modules > How do I view the MasteryPaths range breakdown results for an assignment?